700 years before Jesus was born here in earth, Isaiah described Jesus’ life, death and purpose for coming. This is one of my favorite scriptures in God’s word because it so clearly explains the eternal healing and peace we receive through Jesus’ sacrifice on the cross. 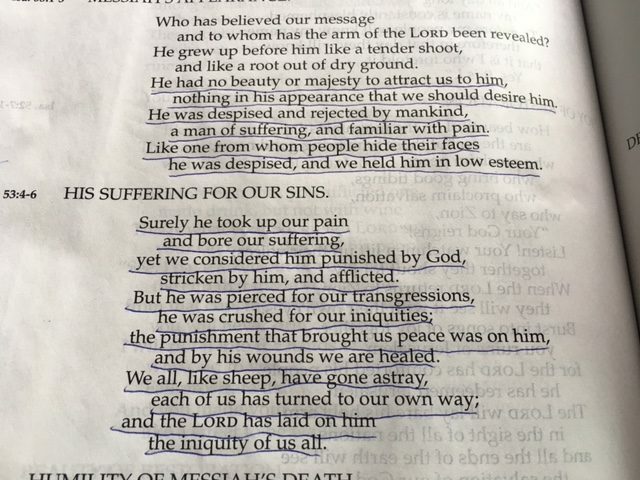 He took our pain and sorrows upon himself. God transferred all of our sins onto Jesus – past, present and future. By his wounds we are healed…..
so now our sins no longer separate us from the love and grace of our Father God. Now we can walk each day in a personal relationship with the Creator of the Universe. All of us have sinned and rebelled against God. God laid all of that – for all time – on Jesus. When we accept the gift of his grace, we are adopted by God as his child for all of eternity.